I don't even know why I'm mentioning this book, because it's so bad. Oh, yeah, I know why: Because it's so bad. Warning: This is a bad, stupid, irredeemable book. I got it from the "New" book shelf at my local library, and can hardly wait to get it back there. 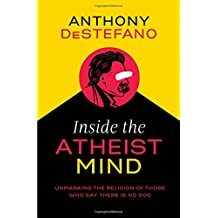 Not only does the author (Anthony DeStefano) have absolutely no idea what is "inside the atheist mind," but he is also an insufferably arrogant prig who doesn't know how to write. I'm going to give only one example, and then go rinse my mouth out: the author has invented a new phrase unique in the history of oxymoronics, when he says that atheists are all "profoundly superficial." Because life is too short to go through this book again.